Small common acquired melanocytic nevi (AMNs) are common on Asian facial skin. Many patients seek their removal primarily for cosmetic or superstitious reasons. For the latter, such cultural beliefs are based on the notion that moles on certain facial locations are deemed unlucky. Some patients also request removal of the nevi to pre-empt enlargement of the mole, or out of fears of malignant change. While the removal of pigmented lesions without prior histological confirmation in a Caucasian patient is undesirable due to concerns of potentially missing a melanoma, such procedures are considered acceptable by some Asian dermatologists as melanomas are rare in Asian skin, particularly on the face. Nevertheless, prior to ablating a benign appearing melanocytic nevus without histological confirmation, a careful clinical examination of all facial pigmented lesions, including dermoscopy, by a qualified dermatologist is essential to exclude atypical features that may suggest a melanoma or early pigmented basal cell carcinoma. The preferred methods of removal of AMNs in Asian facial skin by dermatologic surgeons include surgical excision, CO 2 laser ablation and Q-switched (QS) pigment lasers. In this study, we report our experience with the 100-μs long-pulsed Alexandrite (μsAL) laser in the photo-thermal ablation of AMNs in Asian facial skin. A retrospective review of Asian patients with small common facial AMNs who were treated with the μsAL laser at the National Skin Centre, Singapore, from January 2010 to April 2012 was carried out. The study was approved by the Institutional Review Board. All patients were seen prior to treatment by a senior dermatologic surgeon with more than 15 years experience. The patients presented with small common AMNs on their face that they wanted to be removed for personal reasons. The lesions were less than 5 mm in diameter, minimally elevated and were uniformly brown-to-black in colour, and were not present at birth. Clinical examination revealed benign appearing lesions with no suspicious features of either melanoma or pigmented basal cell carcinoma, and dermoscopic examination for all lesions showed a regular, symmetrical pigment network. A three-point checklist to exclude malignancy (i.e., lack of asymmetry, atypical network and blue-white structures) was applied to all lesions. All patients declined a surgical biopsy and opted instead for laser ablation without histological confirmation based on the clinical diagnosis of common AMN. All adult patients gave informed written consent for the treatment, while those under the age of 21 years had informed written consent given by a parent or guardian. Patients were treated with 755 nm Alexandrite laser (TriVantage TM by Candela Corporation, Wayland, Massachusetts, USA) using the 100 μs long-pulsed mode by a single dermatologic surgeon. Pre-treatment photographs were taken for all patients. Local anaesthesia with 1% injectable lidocaine was given 5 min prior to the laser procedure. The following parameters were used: pulse duration of 100 μs, spot size of 3 mm and fluence of 28 J/cm 2 . The skin surface was cleansed with a 1% chlorhexidine solution. A stacking technique was used. The first pass consisted of delivering 6-8 stack pulses of the laser energy to the pigmented lesion. After the first pass, the skin was allowed to cool for 5 min, the surface debris cleansed away and the skin reassessed. Residual moles indicated by visible pigmentation were retreated with a second pass of another 6-8 stacked pulses. After treatment, all patients were given standard verbal and written post-laser wound care advice and were counselled to avoid direct ultraviolet exposure for the next 3 months. All patients were followed up at 4 weeks after treatment and had post-treatment photographs taken. Pre- and post-treatment photographs were subsequently reviewed by two independent dermatologic surgeons not involved in the treatment process. The following outcome parameters were assessed: Investigator's global assessment (IGA), degree of clinical clearance and complications of treatment. IGA of the entire patient's visage was graded according to a 0-10 visual analogue scale (VAS) to represent overall clinical efficacy. The mean of two scores was calculated. The grades 0-4.5 were agreed to represent 'poor' results, 5.0-6.5 taken as 'mild', 7.0-8.5 as 'good' and 9.0-10.0 as 'excellent improvement. Degree of clinical clearance was graded for each AMN treated. Assessment outcomes recorded were: 'completely cleared', 'incompletely cleared', 'no change' or 'worsened'. 'Completely cleared' was defined as the total absence of any pigmentation in a treated lesion, 'incompletely cleared' was defined as significantly reduced pigmentation in a treated lesion and 'worsened' was defined as a paradoxical increase in pigmentation or size of a lesion after treatment. Local complications for each treated AMN were also assessed. These included hyperpigmentation, hypopigmentation, persistent erythema, atrophy and hypertrophic scarring. Each parameter was graded as 'none', 'mild', 'moderate' or 'severe'. A telephone survey was conducted for all patients at 3 months or greater after their laser treatment. Patients were asked about their general satisfaction with the procedure, graded on a 0-10 VAS, 10 representing the most satisfaction. They were also asked about any recurrence of the lesions (Yes/No), and the extent of post-inflammatory hyperpigmentation (PIH), post-inflammatory hypopigmentation, atrophic scarring and hypertrophic scarring experienced 3 months post-treatment. The latter parameters were graded 'none', 'mild', 'moderate' or 'severe'. Patients, or guardians, were also asked if they would recommend the procedure to a friend seeking to remove similar small common AMN on the face. Eighteen patients with a total of 53 AMNs were treated. The patients' mean age was 29.4 years (range: 7 to 63), and each patient was treated for an average of 3.78 AMNs (range: 1 to 11). All patients were of Han Chinese descent and had Fitzpatrick skin type IV. All presented with small common AMNs primarily on the face [Table 1]. None of the patients had a personal or family history of melanoma or basal cell carcinoma. All patients were resident of Singapore, which has a perennial tropical climate. Investigator's global assessment showed 7/18 (38.9%) patients as having 'excellent' results and 11/18 (61.1%) patients as having 'good' results. No patients were graded with 'mild' or 'poor' results. At 4 weeks post-treatment, 49/53 (92.5%) AMNs were assessed to be totally cleared clinically [Figure 1] and [Figure 2], while 4/53 (7.5%) AMNs were found to be incompletely cleared. No histological assessment of clearance was performed as these patients had previously expressed their wish for no surgical excisions on the face. No lesion was deemed unchanged or worsened compared to the pre-treatment photographs. For the four AMNs that were incompletely cleared after the 1 st laser treatment, a second μsAL laser treatment was performed which managed to clear 3/4 (75%) of them. At 4 weeks post-treatment, mild PIH was seen in 11/53 (20.8%) of treated sites. Post-inflammatory hypopigmentation occurred in 11/53 (20.8%) of treated sites of which 10/53 (18.9%) were mild and 1/53 (1.9%) was moderate. Persistent erythema occurred in 12/53 (22.6%) of treated sites of which 11/53 (20.8%) were mild and 1/53 (1.9%) was moderate. Skin atrophy, i.e., depressed scarring occurred in 15/53 (28.3%) of treated sites of which 14/53 (26.4%) were mild and 1/53 (1.9%) was moderate. The occurrence of mild hypertrophic scarring was observed in 4/53 (7.5%) [Table 2]. 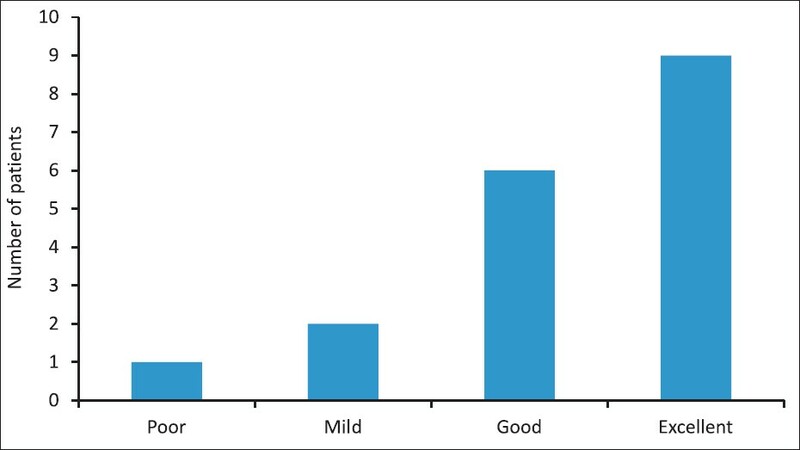 Patient satisfaction with μsAL laser removal of AMNs was generally high, with 9/18 (50%) of patients reporting 'excellent' (9.0-10.0 on VAS) and 6/18 (33%) reported 'good' (7.0-8.0 on VAS) [Figure 3]. Two patients reported the recurrence of a single AMNs each after 3 months (i.e., 2/53 lesions had a late recurrence). All patients reported that the initial adverse effects (i.e., erythema, hyperpigmentation, atrophy, hypertrophic scarring, etc) resolved satisfactorily with time. All patients reported that they would recommend this procedure to a friend seeking to remove small common facial AMNs. Small common AMNs of the face are ubiquitous, and their removal is usually requested for cosmetic reasons. Dermoscopic examination of these lesions reveals a regular pigment network with no asymmetry in distribution, and no alarming features such as blue-white structures. When biopsied, they are frequently characterised by melanocytic nevus cell nests along the dermo-epidermal junction, with a negligible or absent deep dermal component. The careful clinical assessment of a pigmented lesion by a qualified dermatologist to exclude atypical features with a dermoscopic three-point checklist to exclude a more sinister pathology is the most important step prior to its removal without further histological confirmation. Procedures that have proven effective in the removal of AMNs include surgical excision, carbon dioxide laser vaporisation , and Q-switched Alexandrite (QSAL) or Nd: YAG laser treatment. While excision, carbon dioxide laser ablation and QS pigment laser treatment result in few adverse events in Caucasian skin, significant PIH is common in Asian type IV skin. Nanosecond domain pigment-specific lasers like the QSAL 755 nm and QS Nd: YAG (1064 nm) lasers , have been used with some success in the treatment of AMNs. However, while such lasers may lighten the AMNs, they rarely clear them totally especially after a single treatment session. The incomplete response of AMNs to QS laser therapy is attributed in part to the short pulse duration, which is not sufficient to thermally destroy all nevomelanocytes. The Alexandrite laser in the normal mode (milliseconds) has also been used to treat AMNs, albeit incompletely, with remaining nevus cell nests seen in the mid- and deep reticular dermis after histological examination. By carefully selecting flat or minimally elevated AMNs which are likely to have no or minimal deep dermal cluster of nevomelanocytes, high clearance rates with the μsAL laser can be achieved, with low rates of recurrence. In this study, we demonstrate that more than 92.5% of treated AMNs were totally cleared with just a single session with the μsAL laser. The thermal relaxation time (TRT) of the melanosome is 0.25-1.00 μs, while that of the melanocyte is 0.1 μs (100 μs). Therefore, the extended pulse duration of 100-μs allows the μsAL laser to better destroy nevomelanocytes of AMNs photo-thermally compared to the photo-acoustic effects of the nanosecond domain QS pigment-specific lasers. The depth of penetration of the 755 nm wavelength is 50% at 1.3 mm,  which makes it suitable for the destruction of nevomelanocytes located in the papillary and upper reticular dermis. While the TRT of the melanocyte is 100 μs, the TRT of the melanocyte nests may differ due to clustering of cells. Intuitively, the TRT of the melanocyte nests will be greater than that of the melanocyte and this may vary based on the actual pathology (i.e., size and depth of the melanocyte cell cluster). We hypothesise that the stacking of pulses is needed to extend the pulse width significantly beyond the TRT of the melanocyte to allow for the destruction of the melanocyte cell clusters. The treatment of AMNs with the μsAL laser differs from conventional techniques as it involves stacking of pulses in order to completely remove nests of nevomelanocytes in the papillary and upper reticular dermis. Stacked pulses may be repeated after 5 min until clinical clearance of any visible pigmentation is achieved. As the μsAL laser works by photothermal ablation, it is of the authors' opinion and experience that residual pigmentation after the first pass represented residual pigmented nevi which requires a second series of stacked pulses to clear and reduce the risk of recurrence. Understandably, there may be concerns that such an aggressive technique may result in excessive collateral thermal damage and subsequent scarring, but this was not observed in the patients treated. We observed good clinical outcomes with minimal atrophic scarring in our study population. At 4 weeks post-laser, atrophic scarring occurred in 15/53 (28.3%) of treated sites of which 14/53 (26.4%) were mild and 1/53 (1.9%) was moderate. Mild hypertrophic scarring was seen in 4/53 (7.5%) lesions treated in this study. Both atrophy and hypertrophic scarring were noted to resolve with time and were negligible by the time patients were contacted for their telephone survey. The ability to administer stacked laser pulses to clear superficially located nevomelanocytes can be attributed to the selectivity of the 755 nm wavelength for melanin. In contrast, such a technique would be considered unsuitable with a CO 2 or an Er: YAG laser, whose primary chromophore is water, and stacking of laser pulses will lead to a significant collateral thermal damage and unwanted deeper tissue destruction and scarring. Our study showed a 4/53 (7.5%) rate of incomplete clearance noticeable at 4 weeks, and 2/53 (3.7%) of lesions recurring after 3 months. Incompletely cleared lesions may be treated again with a 75% chance of clearance after the 2 nd session with the μsAL laser. At our centre, the standard treatment of small common melanocytic nevi on the face includes excision and CO 2 laser ablation. Excision results in a linear scar and CO 2 laser ablation results in either a mildly hypertrophic scar or an atrophic scar. This study explores the efficacy of the 100-μsAL laser in the removal of small common melanocytic nevi on the face. In the authors' experience, the side-effects of this modality were found to be similar to CO 2 laser ablation. While a millisecond Alexandrite (msAL) laser would also results in favourable clinical responses in the treatment of CMNs, this modality was not available at our centre. The limitations of this study include the relatively small number of patients, as this was a novel procedure. Furthermore, the long-term sequelae (beyond 3 months), while negligible, were assessed subjectively through a telephone interview. Although recalling the patients for a formal clinical assessment would have been ideal, many of the patients had complete clearance of their lesions after a single session, and had long been discharged from the hospital. A further drawback of this study includes the lack of histological assessment of clearance of the nevocellular nests post-treatment, and judgement of clearance was purely based on clinical findings. The patients who opted for the treatment with the μsAL laser were averse to facial biopsies from the start, and thus were not amenable to this form of assessment. In summary, stacked μsAL laser treatment is an effective modality for the removal of carefully selected small common facial AMNs. It is convenient as it requires just a single session in most patients, and has a low risk of post-inflammatory pigmentary changes. Patients who opt for this procedure should be counselled to expect some mild atrophy of the treated skin, which improves with time. Good results for small common AMNs have also been obtained with the short-pulse Erbium: YAG laser,  and the QS Nd: YAG laser in Asian skin [Table 3]. , Future head-to-head studies comparing these lasers, the μsAL laser, the msAL laser and the carbon dioxide laser will be useful to identify the preferred laser for the removal of facial AMNs in Asian patients. 1. Available from: http://www.chinesefortunecalendar.com/FaceMoleReading.htm. [Last accessed on 2012 Dec 14]. 2. Bellew S, Del Rosso JQ, Kim GK. Skin cancer in asians Part 2: Melanoma. J Clin Aesthet Dermatol 2009;2:34-6. 3. Paradela S, Del Pozo J, Fernández-Jorge B, Lozano J, Martínez-González C, Fonseca E. Epidermal nevi treated by carbon dioxide laser vaporization: A series of 25 patients. J Dermatolog Treat 2007;18:169-74. 4. Boyce S, Alster TS. CO 2 laser treatment of epidermal nevi: Long-term success. Dermatol Surg 2002;28:611-4. 5. Rosenbach A, Williams CM, Alster TS. Comparison of the Q-switched Alexandrite (755nm) and Q-switched Nd: YAG (1064nm) lasers in the treatment of benign melanocytic nevi. Dermatol Surg 1997;23:239-44. 6. Reda AM, Taha IR, Riad HA. Clinical and histological effect of a single treatment of normal mode alexandrite (755nm) laser on small melanocytic nevi. J Cutan Laser Ther 1999;1:209-15. 7. Trafeli JP, Kwan JM, Meehan KJ, Domankevitz Y, Gilbert S, Malomo K, et al. Use of a long-pulse alexandrite laser in the treatment of superficial pigmented lesions. Dermatol Surg 2007;33:1477-82. 8. Ho SG, Yeung CK, Chan NP, Shek SY, Chan HH. A comparison of Q-switched and long-pulsed alexandrite laser for the treatment of freckles and lentigines in oriental patients. Lasers Surg Med 2011;43:108-13. 9. Choi JE, Kim JW, Seo SH, Son SW, Ahn HH, Kye YC. Treatment of Becker′s nevi with a long-pulse alexandrite laser. Dermatol Surg 2009;35:1105-8. 10. Ross EV, Anderson RR. Laser-tissue interactions. In: Goldman MP, editor. Cutaneous and cosmetic laser surgery. California: Elsevier Mosby; 2006. p. 1-26. 11. Goldman MP, Fitzpatrick RE, editors. Cutaneous laser surgery: The art and science of selective photothermolysis. St Louis: Mosby; 1994. 12. Westerhof W, Gamei M. Treatment of acquired junctional melanocytic nevi by Q-switched and normal mode ruby laser. Br J Dermatol 2003;148:80-5. 13. Tursen U, Kaya TI, Ikizoglu G. Round excision of small, benign, papular and dome-shaped melanocytic nevi on the face. Int J Dermatol 2004;43:844-6. 14. Baba M, Bal N. Efficacy and safety of the short-pulse erbium: YAG laser in the treatment of acquired melanocytic nevi. Dermatol Surg 2006;32:256-60. 15. Vibhagool C, Byers HR, Grevelink JM. Treatment of small nevomelanocytic nevi with a Q-switched ruby laser. J Am Acad Dermatol 1997;36:738-41. 16. Kim YJ, Whang KU, Choi WB, Kim HJ, Hwang JY, Lee JH, et al. Efficacy and safety of 1064nm Q-switched Nd: YAG laser treatment for removing melanocytic nevi. Ann Dermatol 2012;24:162-7.